A former New York lawyer convicted of helping a jailed Egyptian militant cleric smuggle messages out of prison lost her bid on Friday to be released from prison because she is suffering from terminal cancer. 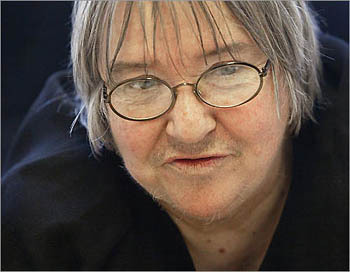 Lynne Stewart, 73, is three years into a 10-year prison sentence after being convicted of aiding her client, blind cleric Sheikh Omar Abdel-Rahman, who was convicted in 1995 of conspiring to attack the United Nations and other New York City landmarks. Maybe someone can smuggle MMS in to here. At least then she can serve out her sentence in good health... if they don't catch the smuggler, that is.